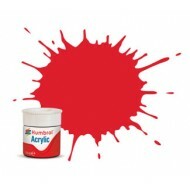 Very high qulaity water-based acrylic paints made with the finest pigments. Being water based it is easy to apply both with brush or airbrush (when thinned). The paint is hard wearing and can be used on most surfaces.